The 2017 YBRA Uplift is available via .pdf link here, and archived with past issues on the site. Director Kirk Johnson of the Smithsonian National Museum of Natural History keynotes the YBRA Industry Day, August 15th 2017. Mr. Johnson is an alumni of YBRA and recent host of the PBS Nova series "Making North America." RSVP's are being accepted here. Industry & community guests must have an RSVP! Summer 2017 season is fast approaching here at YBRA and we could not be more excited for what it will bring! New students, new research, new building projects, and of course, the same great rocks and views at your favorite field station. We were expecting a very hard and rocky excavation, but to our surprise revealed this rich orange soil. The Russ Dutcher student dormitory is officially underway as we broke ground for its foundation yesterday April 24th! Nestled just above the road between Bucher and Siegfriedt, the bunkhouse will sleep up to twelve students and is projected to be finished this coming summer. The creation of this dorm will also allow re-conversion of Wadsworth back into a study hall to give us much needed study space for groups, especially during peak times when several groups are on campus. 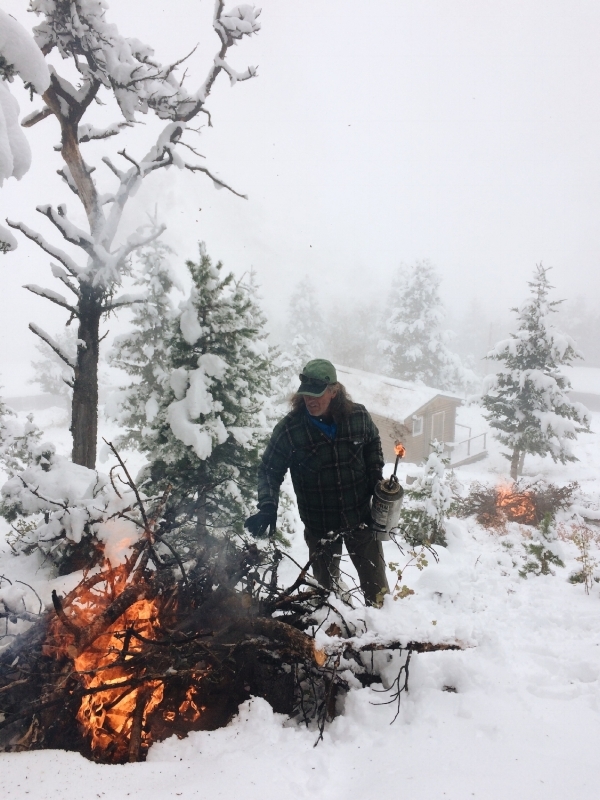 Camp manager Greg Creasy taking advantage of snowfall to help prepare camp for summer 2017. For the past 80 years YBRA has been dedicated to experiencing, learning, and leaving a legacy in Earth science education. We would not be able to keep opening our doors and make upgrades to the camp, like the Dutcher Dorm, without the consistent support and dedication of our volunteers, schools, partners, alumni, and other donors. Make a contribution today to support YBRA in its growing legacy. William E. “Bill” Bonini, 90, of Princeton, NJ passed away Tuesday, December 13. Students, colleagues and friends lost a teacher, mentor and loved one; he died peacefully with family at his side. To read the official obituary please follow this link. In honor of Bill and his dedication to geoscience education and research, a Memorial Fund through YBRA is in place. Thank you for helping Bonini's legacy live on through supporting YBRA. 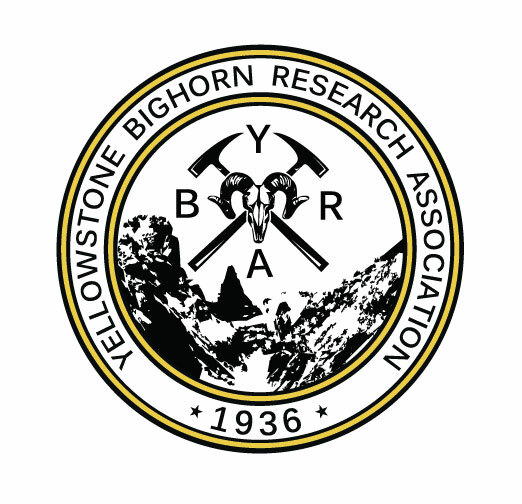 YBRA had a strong presence at the Geological Society of America's national meeting this past week in Denver, CO. New students, academics, and industry professionals learned about our 80 year old operation in the Beartooths. Thanks to everyone who stopped by our booth! The Colorado Convention Center bustling with geo-scientists all week long. Grand Valley State University students learning about YBRA. YBRA Alumni from every decade and all over the world re-connected at our booth in the exhibit hall of the Colorado Convention Center. We saw alumni from Ohio University, Princeton, Amherst, University of Houston, Penn State, Franklin and Marshall, and a big turn out from Southern Illinois University from this past season! There was hardly a time where the YBRA booth was empty! Attendees cleared out our supply of "I AM YBRA" buttons and YBRA stickers of our official logo. (Left) Noel Potter, YBRA 1948, with Camp Manager Greg Creasy, YBRA SIU 1986 (right). Stephania Zneimer, YBRA SIU 2016, engaging the audience with her research poster. Princeton and YBRA had a joint private reception Monday night at the Hyatt Regency Center. 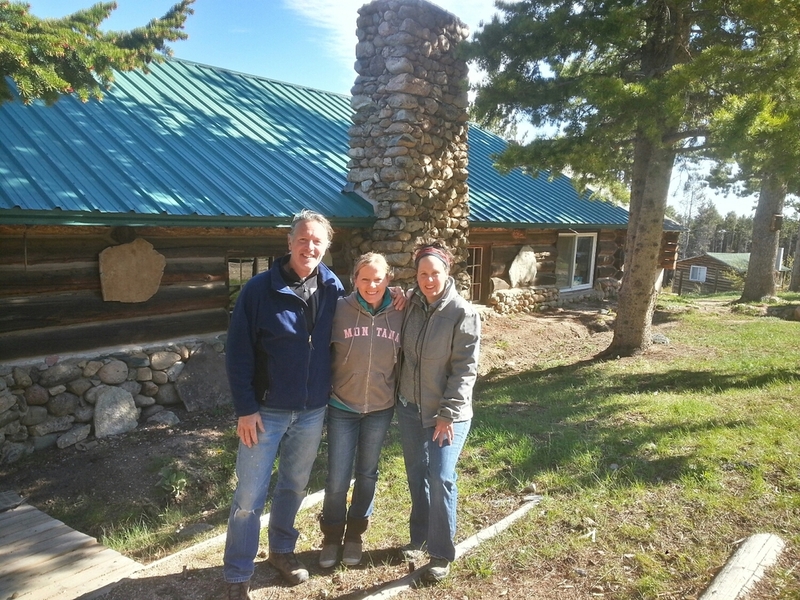 Alumns from Princeton and YBRA got together to reminisce a sacred past time of living in log cabins in the Beartooth Mountains that crosses generations. It was beyond enjoyable and a great night to remember! YBRA alumni from SIU 2016 field course at the Princeton/YBRA joint reception Monday night. If you missed out on GSA 2016, we will be in Seattle, WA next year for GSA 2017! Also we will be attending the the AAPG meeting in Houston June 2017. See you there! Last week we hosted three separate events to help celebrate our 80th year of operation. We hosted our first New Projects Design Charrette, 3rd Annual Industry Day, and 80th Anniversary Open House! A Charrette is a collaborative-administrative meeting to discuss planning of major building projects and updates for the coming years. The committee consisted of YBRA admins working with a few outside professional advisors who are also YBRA alums to discuss the plans. President Dr. Rich Fifarek explaining two possible locations and designs of the new conference center. Professional conference center to host YBRA meetings, third party conferences, and alleviate crowded teaching conditions with capacity for two new study halls. Russ Dutcher Dormitory will be a new student dorm to honor Russ Dutcher and his legacy at YBRA. The new building will sleep 12 students and allow re-conversion of Wadsworth back into a study hall. Schematic drawing of the conference center as a one story building. Draft by Susan Euker. Reinhart Lounge is an addition (already underway) to the Fanshawe Lodge in the back of the kitchen and a tribute to Jeanette Reinhart who has faithfully served in the kitchen for over 40 years. It will be a lounge, bathroom, and shower for YBRA staff to enjoy. These projects still require much more funding and planning, which we need your help to accomplish! Dr. Fifarek and Greg Creasy stake out where the Reinhart lounge will reside coming Spring 2017. This year was our biggest turnout for industry day with around 40 attendees. We gathered in the lodge to hear industry professionals in the geo-science realm give presentations about their research and current work to help bridge the gap between industry and academia. Geologist Riley Brinkerhoff with SM Energy in Billings, MT presenting his research with the Montana Geological Society. He explains how Bear Creek will inevitably run into Rock Creek and capture it's flow near Red Lodge, MT. 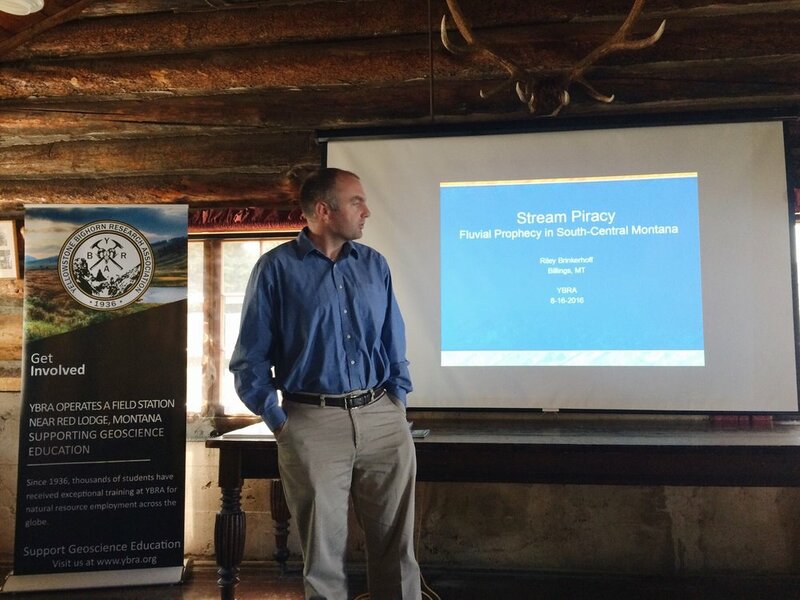 The presenters included geo-scientists from SM Energy in Billings, Shell Oil Co., The Bighorn Basin Dinosaur Project, USGS, and CGG Oil & Energy. The afternoon ended with a networking cocktail reception on the back porch as the sun dipped below the Beartooth Mountains. 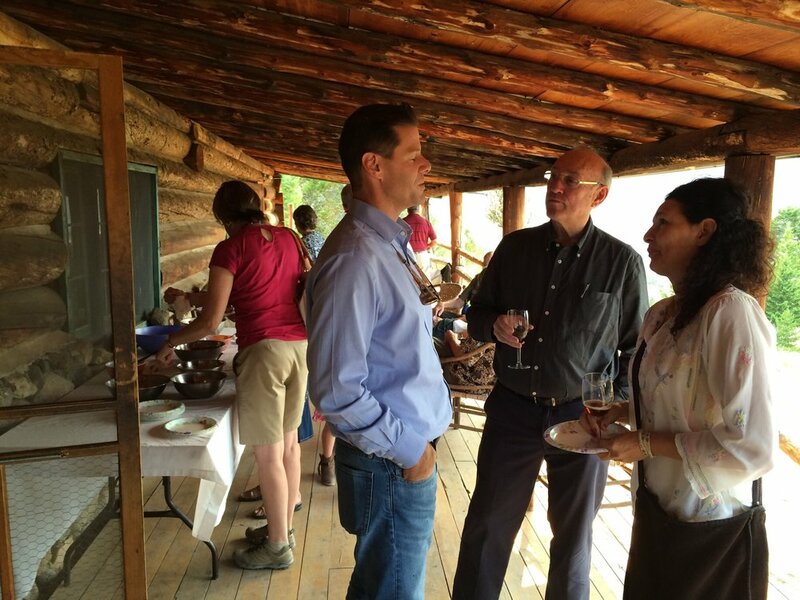 Tyler Krutzfeldt and wife Pamela talk with George Buzan of CGG during the Industry Day reception. Our doors were opened to anybody and everybody who wanted to come see the camp and what we are all about. 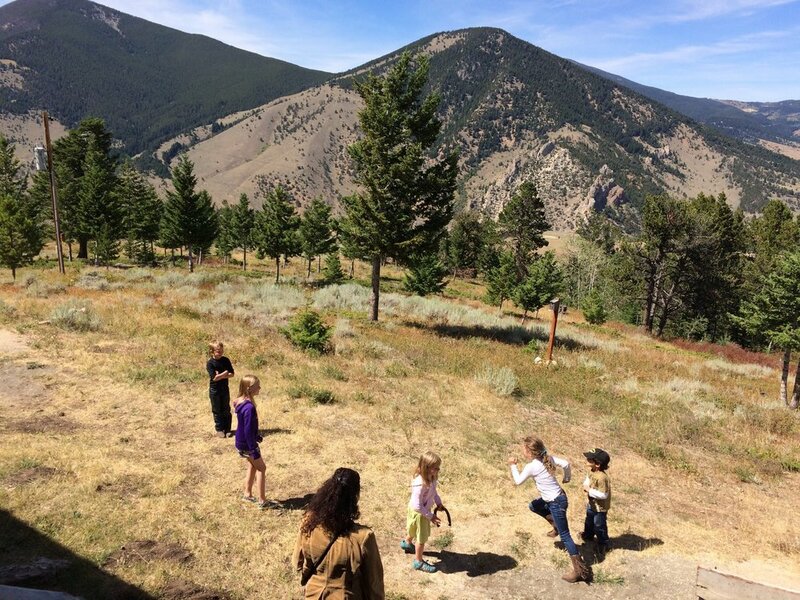 Local Red Lodge children enjoying life on a mountain at the 80th anniversary open house. To think we have been in Red Lodge for 80 years and some locals still don't know who we are! It was great to fire up the grill and connect with friends and neighbors to share the YBRA story. Over 60 people showed up over the course of the afternoon to see our charmingly rustic campus. Dr. Phil Robertson gave two camp tours to give new comers an idea of what we do. What an exiting time to be at YBRA! Here's to another 80 years of serving geo-science education and the Greater Red Lodge area! Dr. Phil Robertson giving the YBRA campus tour and how it has grown over the years. Paleontologist/Geologist Kirk Johnson, the Smithsonian's Sant Director of the National Museum of Natural History and Will Clyde, professor of geology at the University of New Hampshire which recently led the Bighorn Basin Coring project, visited the Buffalo Bill Center of the West today in Cody, WY. 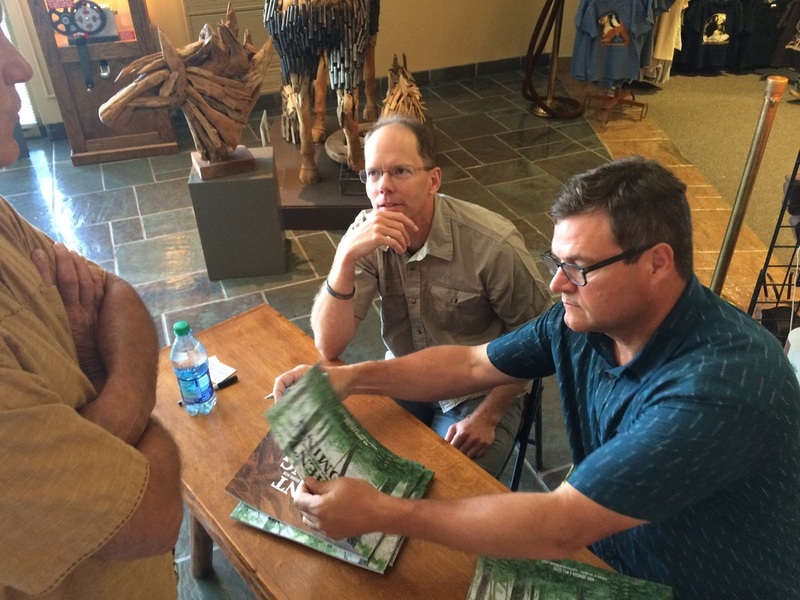 Their book, Ancient Wyoming: a dozen lost worlds based on the geology of the Bighorn Basin, was presented during the lecture and they donated fifty signed copies to YBRA. It was great to re-connect with Johnson and Clyde decades after they attended Princeton's YBRA field course, which is when they first discovered the world renown record of Earth history in the Bighorn Basin. The auditorium was packed with an attentive and engaging audience. The museum even sold out their stock of books to sign. Who knew being a geologist could make you a celebrity! Thanks Kirk and Will, keep up the great work! Left to right: Evan Lavery (YBRA), Greg Creasy (YBRA), Bonnie Smith (Buffalo Bill Center of the West), Kirk Johnson (Smithsonian), Will Clyde (University of New Hampshire). The season so far has been great. Montclair State NJ, University of Wisconsin Plattville, Penn State and University of Houston are the schools here up till now, Southern Illinois University will arrive on Sunday. Looking forward to seeing New Jersey State Museum, Ohio State, The Woods Project, Lancaster County Conservancy and Roger Williams University. The fearless leaders of the University of Houston. Diana, Erik, Tom, Joel and Matt. One more week and our first group will be here. The camp just needs the small finishing touches. This year we had Karen Lundell here to help with the camp opening. Karens goal is to work as an Oregon forest ranger but needed some maintenance skills on her resume. She accomplished any task given to her with flying colors. It was a pleasure working with her and I'm sure that Oregon will be proud to have her as a forest ranger. Good luck Karen and thank you for your help and dedication. Camp opening starts in less than a month. We had very little snow fall again this year but this latest 20+ inches couldn't be more welcome. We're looking forward to seeing old friends and new students in June. 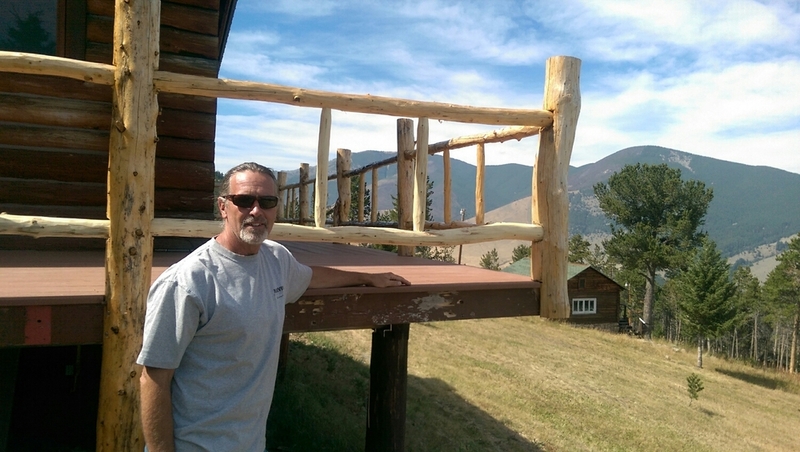 Greg Creasy completes first new decking project at YBRA; handmade from YBRA timbers! The best views of the Beartooth front just got better! 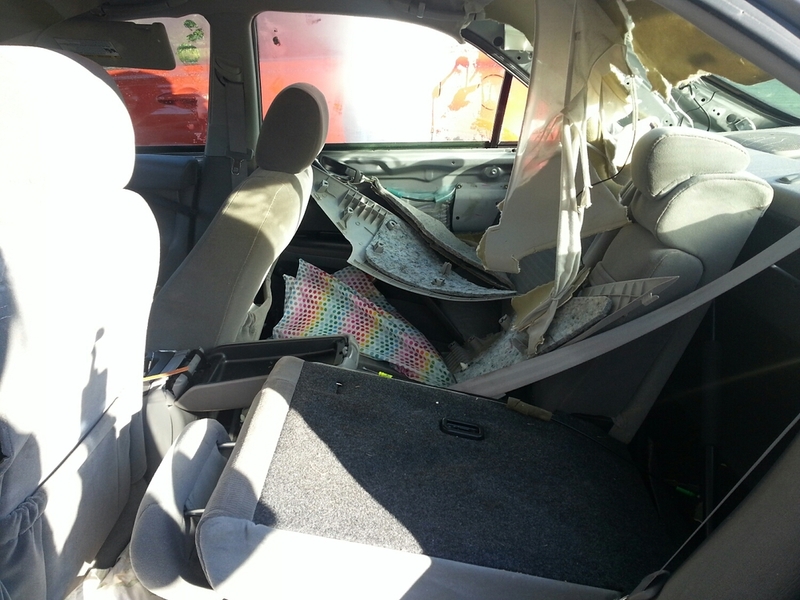 Last week YBRA made national news when a bear became trapped in Ellen Stolpes car, a volunteer here at camp. The story was picked up by the Associated Press, New York daily Times, Billings Gazette, ABC National News and just spread from there. Here are a few links of this story. 17 students and 7 volunteer leaders, including two industry geologists and one geology grad student, spent five nights at YBRA, as well as an additional night when bad weather precluded a backpack trip after several days in Yellowstone National Park. Our high school juniors and seniors from Houston came away with a deep appreciation for geology, the woods, and Jeanette and Greg! Look forward to more good things in the woods at YBRA next year. 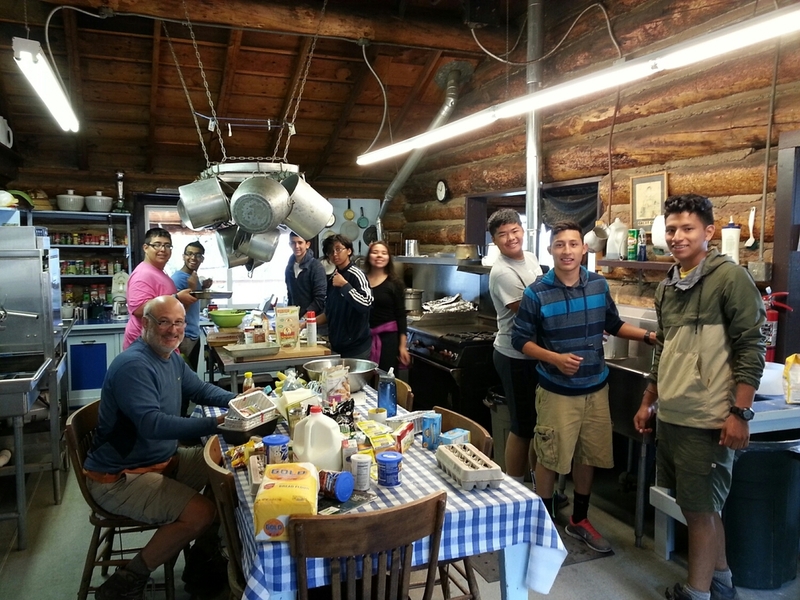 These awesome students from The Woods Project made dinner for Jeanette and crew after an unplanned stay at YBRA after their backcountry trip was postponed due to rain.